The Story So Far could have taken the easy route on their debut full length by re-recording the tracks off their EP and bundling it with a few sub-par b-sides, thankfully they haven’t. ‘Under Soil And Dirt’ does feature a couple of re-recorded songs, but they sound more vital than the originals, and the additional material is fresh, exciting and better than anything the group has tabled in the past. ‘Under Soil And Dirt’ is a spotless slice of modern pop-punk. It is without any of the sticking points that ruins so many modern pop-punk albums. There are no synths, no beat downs and no whiny vocals. In fact, the vocals and lyrics of Parker Cannon are perhaps the album's biggest selling point. Relentlessly brilliant and full of energy throughout, when Cannon sings not only are you instantly hooked by the passion, but you believe what he is singing. The Story So Far are a band though, and the four musicians in the band also deserve plaudits. They cohesively complement each other to provide plenty of hooks and catchy rhythms, which result in awesome songs. Tracks like opener ‘States And Minds’ and the re-worked ‘Rally Cap’ are where the musical progression of the band is so evident. There is a much fuller sound and a boundless energy to these tracks, which was perhaps undersold on past efforts. ‘Under Soil And Dirt’ doesn’t have a bad track on it, every one has something to offer. That said there are still a handful of tracks that shine above the others. ‘Quicksand’ is the most instant. It has a catchy chorus and reprise, which will have you singing along during your first listen, and is also littered with contagious guitar work. ‘High Regard’ and the re-recorded ‘Mt Diablo’ are also destined to be fan favorites for similar reasons, but it’s on the sublime ‘Daughters’ where the band hits its peak. Structurally interesting, with an unbridled passion to the vocals, it's definitely ‘Under Soil And Dirt’s best track. 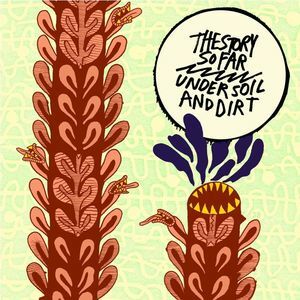 The Story So Far have not only produced a brilliant début album, they have produced one of the best debut releases in this genre for some time. It’s not unreasonable to expect to see the type of explosion in popularity that has recently happened to The Wonder Years repeat itself with these guys. ‘Under Dirt And Soil’ it out now on Pure Noise Records (US) / Hangtight Records (UK).